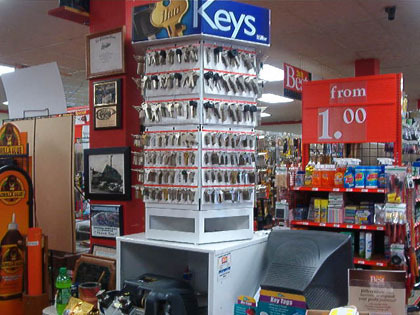 Burke's offers key cutting / duplication at our key making center. We have key blanks for most applications. We also offer glass cutting services. Have a broken window? Give us the exact dimensions and we can get your replacement glass cut and ready for you while you wait. Burke's Home Center offers free estimates. Bring in your plans or even your ideas and someone will visit with you to discuss your project and we will provide a materials list and cost estimate for you. Whether you are considering a kitchen or bath remodel, flooring or roofing project, or landscaping improvements, Burke's is here to help you. No job is too small or too large. From dog houses to large pole barns and everything inbetween. Don't forget our truck materials delivery service. We guarantee same day delivery on materials purchased before 10:00 a.m. and can deliver right to where you need them. Our stores also offer UPS shipping service. We are a pick-up and drop-off point for UPS.